X-Small- fits chest measuring 13"- 19"
Small- fits chest measuring 16"-22"
Medium- fits chest measuring 20"-28"
Large - fits chest measuring 22"- 35"
X-Large- fits chest measuring 34"- 48"
Measure girth around the broadest part of the dog's chest, right behind the front legs. This should be a snug fit. You can use a cloth measuring tape, a piece of string, or rope. If using a string, or rope, determine the size needed, and then place the string or rope on a ruler to get the correct measurement. 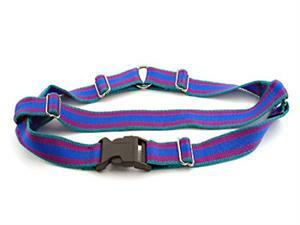 Slip the "Easy Walker" Walking Harness over the dog's neck so the large "O" ring is positioned on the dog's chest. Make sure the black plastic lock buckle is positioned under the dog's belly, and snap together to close. Make necessary adjustments to the Easy Walker Walking Harness to fit comfortably, and secure. Attach the leash to the "O" ring on the chest, and run the lead over the dog's right front shoulder. This will apply pressure at the chest when you need it, and restrict the dog's forward movement. As soon as the dog stops pulling, release the pressure on the leash. Great for everyday use. Matches our solid nylon color collars. Leads can be ordered with either Small or Large Bolt Snaps. This 2 disc DVD, released from Jack and Wendy Volhard, features their patented Motivational Method™ of training.